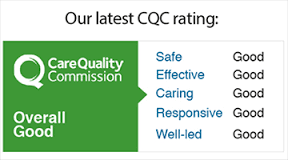 Since 1st April 2015, if your organisation has been given a rating by the CQC, you are required to display the poster prominently in your main area and on your web site. Failure to do so will result in a fine and earn you a black mark against any future inspection. If you have been awarded a CQC rating (outstanding, good, requires improvement or inadequate) you must display it in each and every premises where a regulated activity is being delivered, in your main place of business and on your website(s) if you have any, where people will be sure to see it. This is a legal requirement from 1 April 2015. CQC will assess whether or not your ratings are displayed legibly and conspicuously – not doing so may result in a fine and may impact on future inspection ratings. CQC will make posters for physical display of your ratings available to download from our website. Using our posters will ensure that you include all the information as set out in the Regulation. You must display your rating online if you have a website(s). You can use the CQC templates for online display to help you do so. These are available from our Ratings display toolkit page. Want to see the full document? CLICK HERE to go to the CQC announcement.